What are the potential risks that may arise during surgery on carpometacarpal osteoarthritis? Will the scar in connection with surgery on rhizarthrosis hurt for a long time? 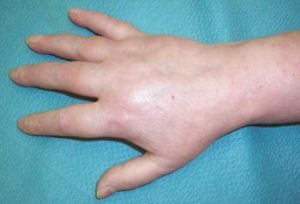 In isolated cases severe mobility dysfunctions accompanied by soft tissue swellings along with significant decalcifications manifesting in the bones of the hand may arise after surgery on carpometacarpal osteoarthritis (CRPS, Complex Regional Pain Syndrome Sudeck´s atrophy, algodystrophy). The image shows a Complex Regional Pain Syndrome (CRPS) with severe swelling on the dorsum of the hand. Complex Regional Pain Syndrome may generally occur after any type of surgery or injury to the hand! Since the cause for this disorder is unknown, no physician can really be certain to avoid this potential surgery-related risk. Infections or wound healing impairments on the surface of soft tissue typically can be addressed through simple measures such as the early removal of stitches, administration of antibiotics, etc. Fast response times after detecting first symptoms such as redness, in most cases will prevent the infection to advance into deeper layers of the thumb saddle joint which underwent surgery. Deep infections are not too common however they are extremely problematic. Second interventions and permanently remaining dysfunctions may be the result thereof. The pain after surgery on carpometacarpal osteoarthritis typically should recede a few days after the procedure. The mobility of the fingers and the thumb increases and the patient will experience less post-operative pain during his/her night rest. Surgery on carpometacarpal osteoarthritis requires the immobilization of the wrist and the first extremity (except for the thumb interphalangeal joint). The wound should be dressed in a way that allows the patient enough mobility to pro-actively exercise his/her fingers and the thumb interphalangeal joint. Nonetheless each surgical procedure to a hand due to pain and swelling may lead to a permanent limited mobility. On an exceptional basis, a larger cutaneous nerve which runs in the thumb may be injured during surgery. The nerve may either get cut or “just” pinched. If the nerve is just compressed the numb sensation will let up – typically on the extensor side of the thumb – allowing the local nerve pain to recede over a period of months. If, however, the nerve was cut an almost spot-like “electrifying” bruise will form within the scare. A neuroma develops leading to the loss of cutaneous sensitivity within the area supplied by the damaged nerve.